Examples one finds in the philosophical literature are somebody who’s seen the trial of a child of theirs, where they’re being proved guilty of some crime that would drive the parent into a depression, maybe a suicidal depression. I guess my tendency is to think essentially that the new wrinkles won’t do the job if the old major idea didn’t, and so you have to try something different. Then maybe they can all be combined in some coherent piece. It’s the level that allows us each to live our own chosen lives. But I notice not everyone agrees with the primary importance of that level, and I try to account for how they don’t. The fact that we don’t keep repeating tests in the same arena is not because the probability of the hypothesis showing its falsity in other arenas goes up after it has passed tests in one arena. It is, from another angle, an attack on requiring proof in philosophy. And it’s also the case, I guess, that my temperament is to like interesting, new, bold ideas, and to try and generate them. I think philosophers can do things akin to theoretical scientists, in that, having read about empirical data, they too can think of what hypotheses and theories might account for that data. So there’s a continuity between philosophy and science in that way. What hadn’t been realized in the literature until now is that merely to describe how severely something has been tested in the past itself embodies inductive assumptions, even as a statement about the past. 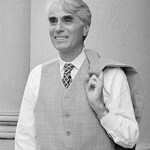 Robert Nozick was an American political philosopher, most prominent in the 1970s and 1980s. He was a professor at Harvard University. He is best known for his book Anarchy, State, and Utopia, a libertarian answer to John Rawls's A Theory of Justice. His other work involved decision theory and epistemology.